Did I mention I'm going back to school? No? I must have forgotten. In case you're wondering, I'm getting my teaching credential to be a science educator. So far it's been swell. The instructors are awesome. My classmates are awesome. Everything's awesome except for the damned reading. Lord save me from the reading. If I'm not reading something as exciting as say, The Bourne Identity or The DaVinci Code, I'll be lucky to make it through a paragraph before nodding off. As you can imagine, reading about pedagogy has been slow going. Anyhow, I decided to put the schoolwork aside for a day and concentrate on stuff I've been neglecting. Like the laundry. Paying the bills. My garden. My poor, neglected blog. Especially my poor, neglected blog. Working on it has always been an outlet, and with all that I've been cramming into my head lately, it's nice to be able let some stuff out. The inspiration for this recipe came from Martin Yan's China. I was flipping through and I saw the noodle "cake" recipe and I remembered trying something similar at my neighbor's house. The combination of crispy noodles with a saucy stir-fry was great. It's a pretty easy dish, but there was a fair amount of prep work because you have to boil the noodles and prepare stuff for the stir-fry. The actual cooking was the quick part. I think it took me about 45 minutes to put this on the table. To flavor the stir-fry, I used fermented tofu with soy beans. I doubt you'll find this at your local supermarket, so a trip to your favorite Asian market is probably in your future. Otherwise, you can use fermented (yellow) soy beans, which your local market might carry. If you're not in the mood to track either down, then by all means, use your favorite stir-fry. I only recommend a very saucy one so the noodles can soak in the sauce. Start by cooking the noodles. Drain and rinse well with cold water and drain again. Toss with a little oil to prevent them from sticking. Set aside until you're ready to fry them. If you can set them in the fridge, even better. They fry better the colder they start. While the water for the noodles gets going, prepare the chicken by combining 2 tsp cornstarch with 1 tbs cooking wine. Turn the sliced chicken in the slurry and set side. Make the sauce for the stir-fry by mashing the fermented tofu and soybeans until you get a paste. Don't worry if you don't mash every single soybean. Add 1 tbs cooking wine, the broth, thin soy sauce (or oyster sauce) and sugar. Mix until well blended. Stir in 2 tsp cornstarch. Set aside. It's best to fry the noodles in two batches. If you try to do it all in one go, you'll probably get a fat cake with a large amount of soft noodle in the middle. Trust me, you'll want to maximize the crispiness. In a non-stick pan (or well-seasoned cast iron skillet), heat a couple of tbs oil over medium heat. Add about half the cooled noodles, distributing them into an even layer. Add half the broth and cook until a nice crispy crust forms and the broth has evaporated. Watch the heat! You wouldn't want your noodles to burn. You may want to move the pan around every so often to distribute the heat better. Flip or carefully turn the noodle cake over and allow a crust to form on the opposite side. 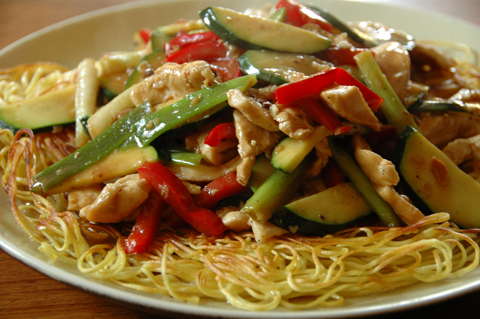 When you're satisfied slide the noodle cake onto a plate and keep warm until you're ready to serve. When you cook the second cake, start heating your wok for the stir-fry. Once it's nice and hot, add some oil and fry the chicken. When the chicken is just about done, remove it and set aside. Add more oil if necessary, then add the garlic, ginger and bell pepper. Stir-fry for a minute, then add the zucchini. After another minute add the chicken back in. Toss well then slowly add your sauce by drizzling it down the side of your wok. Hopefully it will begin to thicken on contact. If it doesn't, no worries. It will once it begins to heat through. Adjust flavor with more soy sauce if necessary. When the sauce has thickened, you're done! Divide the stir-fry over the two noodle cakes and serve immediately. I like to put out chili-garlic sauce as well, for those who like it spicy. This is my submission for Regional Recipes. We're in China! If you'd like to participate, I'll take submissions until the 20th. C'mon, you know you want to! Send your submission to me at blazinghotwok(at)gmail(dot)com. Be sure to include a photo (about 200x200) so I can include it in the round-up! Whoa! School ... work ... parenthood ... blogging ... whew, I feel the need for a multi-vitamin! Seriously, though, kudos to you for pursuing what makes you happy! My oldest girl loves science. She attended the Intel Science Expo this year at Portland State. We both were completely blown away by the projects presented there. I felt like I was in another universe walking among those smart, smart, SMART kids. It was polymer this, and atom that, and fractal this and who knows what else that! It was very impressive. Speaking of impressive, this noodle cake recipe is AWESOME! That saucy stir fry really hits the spot. It's so darn pretty to look at, too! YUM! Let's see...family, work, school, homework, sleeping...oh, and blogging. Yeah, you obviously need to move blogging up on your priority list! Good luck w/ school, very cool of you to do. And your dish looks awesome. It has gone on my immediate to-make list. Great pic, too! One question about your regional recipes: can it be something I've made and blogged about previously? BB, it's fine as long as it's fairly recent. If it's like from 6 months ago, just revamp it. Also include the link to RR so people know where to go if they want to participate. The Woman, thanks! I'm doing the happy dance because the end of the term is almost here! Yay! Good for you, we always need good science teachers. Darlene, this looks delish! I've tried making crispy noodle cakes before and it did not turn out well, thanks for the info. As for the stir fry, I love how simple it is. How great does this look :-). PDG I'd say. I had no idea you had gone back to school. I suspect you'd be a wonderful teacher, but boy, oh boy, is your plate full. Don't forget to take care of yourself. Jason, there are so many things that can go wrong with frying the noodles...I just take my time over a medium-low heat. And I wish I had a heat diffuser to help distribute the heat to get more even browning. Mary, thank! I heard we can expect to get sick often this first year because teenagers are so germy. I'm definitely going to try to exercise and sleep well.